You've found the “U.S. Dutch Belted Cattle Breeders” page here at Hobby Farm Wisdom! If this is the first time you have visited our site: Welcome! The Dutch Belted is primarily a dairy cattle, with cows ranging in size from 900 – 1500 pounds and bulls reaching 2,000 pounds. Named after its country of origin and appearance, Dutch Belted are mainly black (or dark red) with their most distinguishing characteristic of a “belt” of white around their midsection. 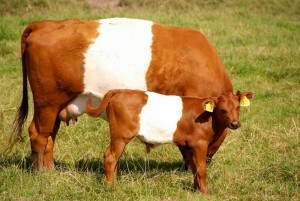 Dutch Belted cattle are widely known for their superior ability to produce 12,000 – 15,000 pounds of milk per lactation period with little grain supplementation needed. They can also reproduce with minimal issues well into their teen years. After almost reaching extinction in the 1970’s, the number of Dutch Belted cattle has been steadily increasing in recent years due to a concerted breeding effort.